Can My Student Loans Be Forgiven If I Become a Nurse? The answer is yes. Nurse loan forgiveness programs exist. If you’re interested in obtaining a degree in nursing, help is available. Let’s look at some of the options. You can find a table further down on the page that explains loan forgiveness for nursing professions in all fifty states. Which Nursing Degrees Qualify for Loan Forgiveness Programs? You are eligible for different loan forgiveness programs depending on the degree you get. For some, you simply need to be a licensed registered nurse to qualify. Others will only cover loans for advanced practice degrees, such as nurse practitioner, and advanced practice specialties, like certified nurse midwife. Nurse educators are also eligible for some loan repayment options, as are those who have earned a DNP or PhD in nursing. We have broken down your options, both federal and broken down by state, below. Summary of the Program: The Perkins Loan Cancellation program allows those eligible to receive nurse loan forgiveness. A portion of student loan debt, up to 100 percent, is forgiven each year over a period of 5 years of qualified nursing employment. How to Qualify: Apply through the school that provided your Perkins loan. Applicants must be full-time registered nurses to be eligible for student loan forgiveness. Members of the military who have a federal Direct or Perkins student loan may be eligible for the National Defense Student Loan Discharge. This program is for those who serve one year in an area deemed under imminent danger and/or in direct fire. Summary of the Program: The NURSE Corps program offers registered nurses (RNs) and advanced practice registered nurses (APRNs) assistance to repay a portion of their qualifying educational loans in exchange for full-time service working in eligible health care facilities in underserved communities that have a critical shortage of nurses. If you apply and are accepted, the program will pay 60% of your unpaid nursing education debt over two years, with an option to extend to a third year for an additional 25% of the original balance. 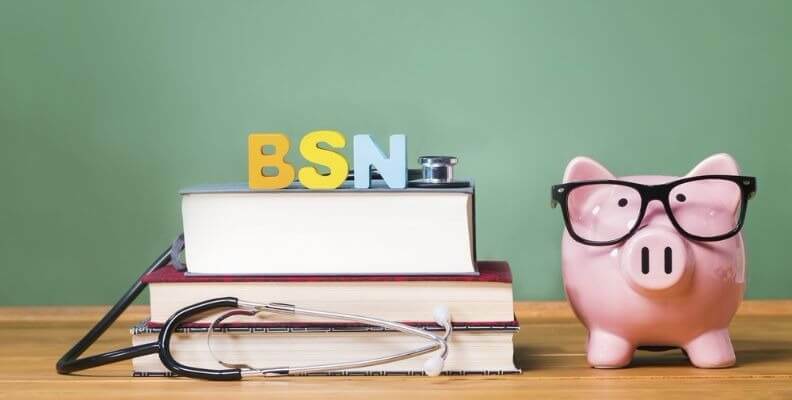 How to Qualify: The NURSE Corps Loan Repayment Program requires you to be a licensed registered nurse or advanced practice registered nurse (CRNA, CNP, CNM, PNS) or a nurse faculty member with qualifying nursing debt. Additionally, you must have received your nursing education from an accredited school of nursing located in the U.S. and work full time in an eligible Critical Shortage Facility (CSF). Funding preference is based on financial need. Summary of the Program: The National Health Service Corps (NHSC) program provides options for primary care providers to serve at an approved site in an underserved area and receive up to $50,000 in loan repayment in exchange for a two-year service commitment. How to Qualify: To qualify, you must be a U.S. citizen (U.S. born or naturalized) or U.S. national working as a licensed Primary Care Nurse Practitioner, Certified Nurse-Midwife, or Psychiatric Nurse Specialist in an approved Health Professional Shortage Area (HPSA). Summary of the Program: Because service to our country is valued and appreciated, special student loan benefits and repayment options are available. Loan repayment programs are offered by all branches of the military. How to Qualify: Members of the military who have a federal Direct or Perkins student loan may be eligible for the National Defense Student Loan Discharge. The program is for those who serve one year in an area deemed under imminent danger and/or in direct fire. The College Loan Repayment Program (CLRP) provides money to qualifying enlisted, active-duty members to pay off student loans up to a maximum of $65,000. Each branch of the military applies its own standards and qualifications based on recruiting needs. The Army and Navy currently offer the maximum amount allowed for non-prior service active duty enlistments. Most states offer one or more opportunities to help nurses/nursing students pay at least part of the debt incurred from attending school. Opportunities abound for those who are interested in advanced nursing. There is high demand for nurse practitioners. Nurse loan forgiveness and repayment programs can help relieve all or part of your student loan burden. You can access degree information and schools in your state by clicking the links within the “to qualify” column. You can also access nursing information and schools in your state through this page. If you are on your phone, be sure to use landscape view to find your state in the table below. Arizona The Primary Care Provider Loan Repayment Program Assistance repaying qualifying educational loans in exchange for two-year commitment to serve in federally designated Health Professional Shortage Areas (HPSA) or Arizona Medically Underserved Areas (AzMUA). Qualified advanced practice providers licensed to practice in Arizona. Arkansas Arkansas Loan Repayment Programs Placement in medically underserved and health professional shortage areas in rural Arkansas. Multiple federal, state, and local programs available. Eligibility requirements vary. California California ASHPD Scholarship and Loan Repayment Programs Programs for Nursing Loan Repayment Programs for multiple types and levels of nursing. Eligibility requirements vary. Colorado Colorado Health Professional Loan Repayment Multiple programs available for service at approved, qualifying sites. Eligibility requirements vary by program. Florida Nursing Student Loan Forgiveness Program Serve areas of the state where critical nursing shortages exist. Work full-time as LPN, RN, or ARNP at approved site with eligible nursing education student loans. Hawaii Hawaii State Loan Repayment Program (HSLRP) Work full-time for two years at a qualifying site. Grant award amounts vary. Sites/donors match funds equal to half of the award. NP, CNM, PA in adult, family, pediatrics, psychiatry/mental health, geriatrics, or women’s health. Illinois Illinois National Health Service Corps State Loan Repayment Program (SLRP) $25,000-$50,000 for two-year program to serve federally designated health professional shortage areas. Advanced practice nurse professionals licensed in Illinois with student loan debt. Indiana Indiana State Dept. of Health Loan Repayment Programs Federal and State programs to work in underserved areas. Eligible full-time professionals including CNP, CNM, and RNs serving qualified facilities. Iowa Iowa Loan Repayment and Income Bonus Programs Federal, state and rural programs for registered nurses, advanced practice professionals, and nurse educators. Eligibility varies by program. Kentucky Kentucky Higher Education Assistance Authority Federal Nursing Education Loan Repayment Program Loan forgiveness up to 60% for RN with qualifying federal student loan balance in exchange for two years’ service at a critical shortage facility. May be eligible to have another 25% forgiven for serving a third year. Priority granted to applicants whose qualified nursing education loans are 40% or more of their annual salaries. Live +Work in Maine Maine offers a variety of programs including tax credits for loan repayment and rural health programs. Eligibility varies by program. Massachusetts Massachusetts Health Care Workforce Center (HCWC) Federal and state programs available, particularly for advanced practice nurses. Eligibility and guidelines vary. Michigan Michigan State Loan Repayment Program (MSLRP) Federal/state/local partnerships provide assistance for consecutive two-year, full-time MSLRP service obligation at eligible practice sites. CNPs, CNMs, PNS serving identified Health Professional Shortage Areas. Minnesota Minnesota Loan Forgiveness Loan forgiveness for health care professionals practicing in rural and urban Health Professional Shortage Areas for a minimum of three years and a maximum of four years. LPNs, RNs, and advanced care nursing professionals. Mississippi Rise Up Mississippi Loan forgiveness in exchange for service. Federal and Mississippi Rural Health programs are available. Eligibility varies. Missouri Missouri Professional Nursing Student Loan Repayment Maximum loans of $2,500 for LPN students; $5,000 for professional nursing students (Diploma, ADN, BSN, MSN, APN, and DNP) with forgiveness earned through qualifying employment. Must be Missouri resident attending a Missouri institution leading to licensure as a practical or professional nurse. Montana Montana Loan Repayment Provides loan repayment of up to $15,000 per year for two years for qualified providers unable to receive NHSC funding. Primary Care RNs, CNM, PNS. Nebraska Nebraska Loan Repayment Programs Local-state matching fund program. Up to $30,000 per year for three years with obligation to accept Medicaid patients in state-designated shortage areas. NHSC SLRP also available Varies by program. Nevada Nevada Division of Public and Behavioral Health (DPBH) Nevada participates in National Health Service Corps loan repayment programs and NURSE Corps Loan Repayment, which pay 60% of qualifying educational loan balance for a 2-year service commitment at a Critical Shortage Facility. Varies by program. New Hampshire New Hampshire State Loan Repayment Program Serve three years in medically underserved populations. CNPs, CNMs, PNS serving identified Health Professional Shortage Areas (HPSAs). New Jersey New Jersey Higher Education Student Assistance Authority Student loan redemption in exchange for full-time faculty employment at a New Jersey school of nursing for a five-year period following completion of approved graduate degree program. Resident of New Jersey holding an approved graduate degree with GPA of 3.0 or higher and hired to full-time faculty at a New Jersey School of Nursing. New Mexico New Mexico Higher Education Dept. For every year of service in a designated area, a portion of loan will be forgiven, up to $12,000 per year, 100% of the loan is eligible for forgiveness. New Mexico Resident for 12 consecutive months, accepted into nursing program at New Mexico public college/university; demonstrated financial need. New York New York State Senate Bill S7377 to create loan forgiveness incentive program for physicians and nurses currently in committee. Nursing Faculty Loan Forgiveness Program and federal programs available. Eligibility varies by program. North Dakota North Dakota Health Care Professional Student Loan Repayment Program Awards up to $22,000 for full-time service in areas of need; up to five years; full repayment of student loans possible. RNs in Behavioral Health; RNs in Specialty Practice, Advanced Practice Registered Nurses. Ohio Ohio Nurse Education Assistance Loan Program Program provides loans up to $1,500 per year. Loan cancellation after full-time work as nurse in Ohio for five years. RN and nurse instructor candidates. Pennsylvania Pennsylvania Primary Care Loan Repayment program Not currently accepting applications. Email loanrepayment@pa.gov to request notification of the next application period. Rhode Island Rhode Island Nursing Reward Program Offers 0% interest for 48 months of loan repayment for Rhode Island Student Loan Authority (RISLA) loans. RISLA loan for students who become licensed RN in RI employed by RI licensed health care facility. South Carolina South Carolina Area Health Education Center $10,000 hiring incentives for advanced practice registered nurses. APRN employed full-time with DHEC. Tennessee Tennessee Graduate Nursing Loan Forgiveness Program RNs in TN who become full-time educators in approved programs for four years can have 25%/year forgiveness of student loan. Enrolled in an approved master’s or a post-master’s degree at an eligible institution. Texas Texas Dept. of State Health Services Several programs available to assist with student loan repayment assistance. Eligibility varies by program. Utah Utah Primary Care and Rural Health Utah SB104 under consideration would offer loans covering tuition, fees and books to full-time students who enter programs that align with workforce needs; 25% forgiveness per year for approved work in Utah. Federal programs; eligibility varies. Vermont Vermont Loan Repayment and Loan Forgiveness A variety of state and federal programs available. Eligibility varies by program. NHSC Loan Repayment and NHSC programs. See program eligibility guidelines. Nursing is one of the most gratifying professions available. Nurses are trusted healthcare professionals who make a difference in people’s lives. There are numerous career paths to choose from and unlimited opportunities to learn, grow, and serve others while making a good salary. Going to school to become a nurse takes time and can be expensive, but loan forgiveness for nurses is available. Don’t let fear of debt keep you from a rewarding career. Gwen Duzenberry, MS,MBA/MPM, PMP is a former teacher who moved into the business world where she has worked for both Fortune 500 companies and entrepreneurial start-ups. Her recent work with hospitals and family physicians throughout the U.S. has given her a deep appreciation of the value nurses provide in the healthcare system.